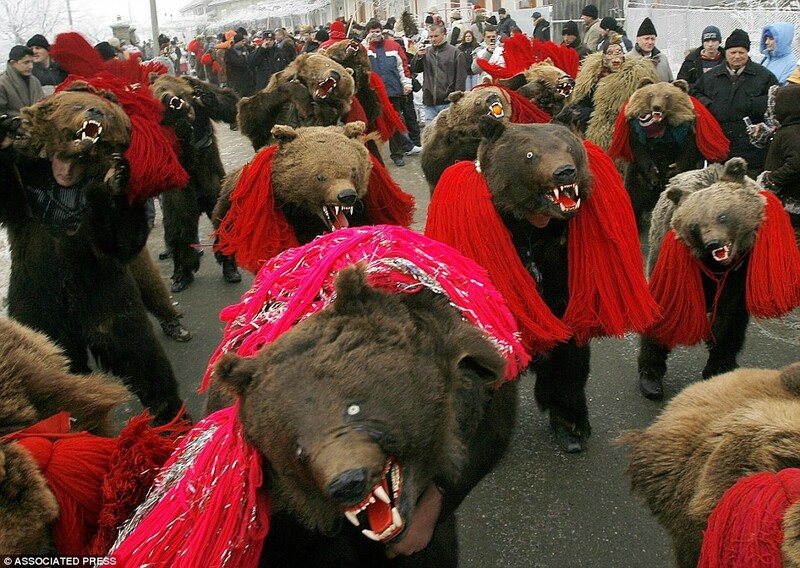 Every year Romanian gypsies dress up in real bear skins and parade through the streets to banish bad and evil spirits. The strange ritual dates back centuries and takes place annually between Christmas and New Years in the Romanian Trotus Valley, 200 miles north of the Romanian capital of Bucharest. The ‘Ursul’ festival, is a based on a tradition when Romani gypsies would come down to the valley from the forest and entertain the people with real bears on chains which they would make “dance” on hot tin plates. Nowadays the dancing bears are humans dressed in bear skins. According to Romanian mythology, bears possesses the power to protect and heal. In the past, villagers would smother a newborn baby with bear fat, to give them strength and luck. Nowadays they believe bear skins protect them from evil spirits. In the photogenic procession, Roma or Romani gypsies dressed as ‘bears’ pretend to roll over and die before they are miraculously resurrected – this symbolises the passing of winter and the re-birth of spring.